The fastest-growing oil producing region in the United States, the Permian, is nearing the limits of its pipeline takeaway capacity and some producers may be forced to shut in wells within months, according to the chairman of one of the biggest U.S. shale producers, Pioneer Natural Resources. “We will reach capacity in the next 3 to 4 months,” Pioneer’s chairman Scott Sheffield told Bloomberg in an interview on the sidelines of an OPEC conference in Vienna, which is attended by representatives of some U.S. oil companies. “Some companies will have to shut in production, some companies will move rigs away, and some companies will be able to continue growing because they have firm transportation,” Sheffield told Bloomberg, commenting on the Permian constraints that threaten to slow down the relentless pace of production growth. Oil production in the Permian is rising by 800,000 bpd annually, with current production at 3.3 million bpd, Sheffield said, adding that total pipeline capacity is 3.6 million bpd, so producers - especially those that don’t have firm deals for pipeline transportation - will be bumping into the limit of takeaway capacity in the next three to four months. The Permian oil production in June is expected to reach 3.277 million bpd, and projected to rise by 73,000 bpd in one month to reach 3.350 million bpd in July, according to EIA’s latest Drilling Productivity Report. A lot of new pipelines are being planned and approved, but none of them are expected to come online before the second half of 2019 - possibly leaving production stranded. The Permian pipeline bottleneck is unlikely to ease for at least one year, Sheffield told Bloomberg, noting that this constraint will continue to affect U.S. oil prices, with WTI at Midland, in the heart of the Permian, likely to trade at a huge $25 discount to the WTI priced at Cushing, Oklahoma. 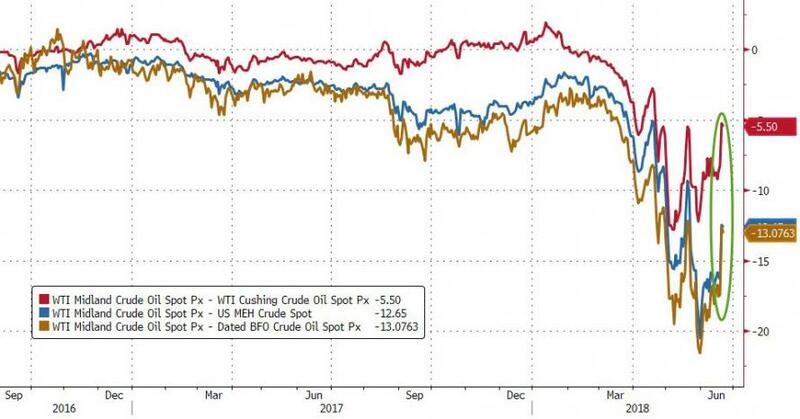 With Permian production booming and pipeline capacity tightening, producers are forced to sell their crude at a painful discount to benchmarks, and they have also recently lost billions of U.S. dollars in market capitalization.